BIT Hotmelt Technology supplies a complete range of high quality hotmelt equipment. From a hotmelt handgun to a complete installation and from various hotmelt modules to automatic filling devices. The hotmelt products from our standard range are shown and explained on the various product pages. Through the interactive picture below you can easily search for the product you need. Click on the required item in the image and you will be automatically redirected to the relevant product page. Would you like to order one of our hotmelt products? The easiest way is via our quotation request form. You can also reach us on 0348 – 563839 or send an e-mail to info@bithotmelt.com. For customization you can also contact us. You will find technical information about our products in our user manuals. 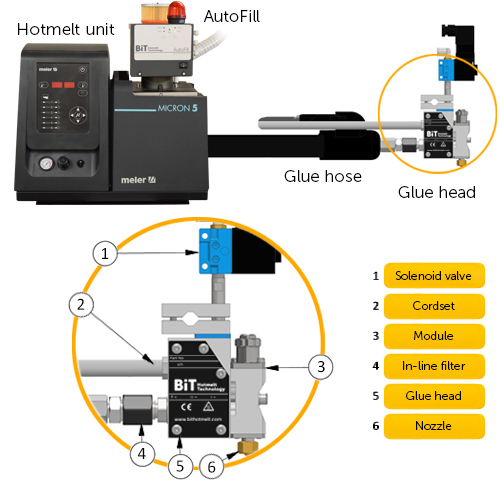 The manuals of the hotmelt products are freely accessible. If you have any questions, feel free to contact us! With many of our products you will find a clear document with additional information.